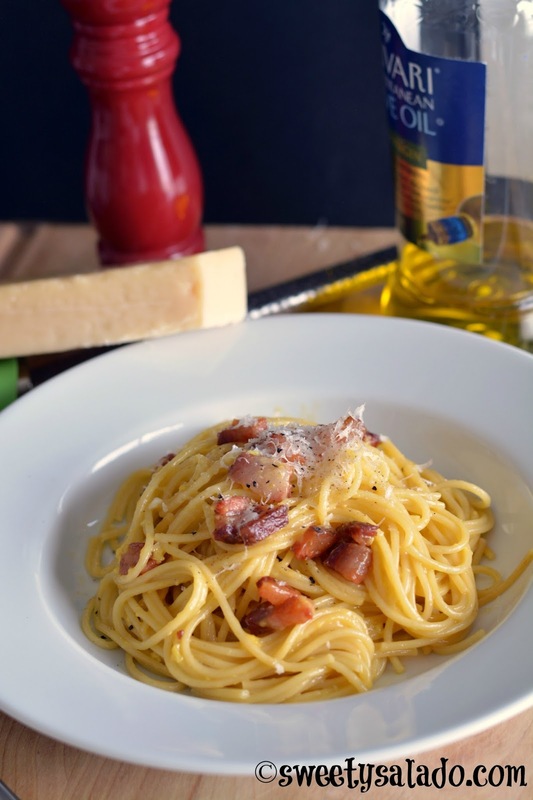 If you want to learn how to make a fancy, delicious, quick and easy dish to impress all your guests, spaghetti alla carbonara is the dish for you. It sounds fancy, because you know, anything with a foreign name sounds fancy, but it couldn’t be more simple to make. I’m not sure if I told you this before but my husband is not a huge fan of eating pasta. He says he is, but I know he’s not because he tends to leave most of it in his plate. However, whenever I make this spaghetti alla carbonara, he eats it all. Which is strange because it’s 90 percent pasta. But then again, it’s made with pancetta, which is only the best type of bacon there is. 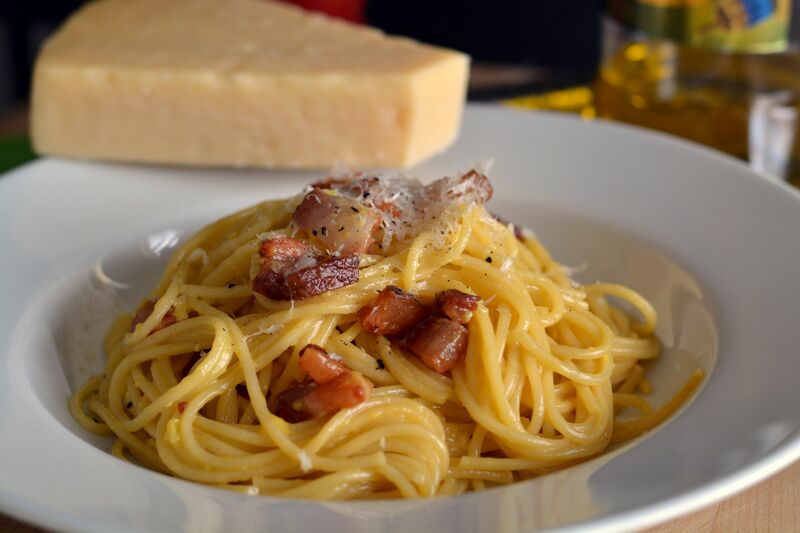 You can also make this with thick bacon, especially if you’re on a budge since pancetta can be a bit pricey. Last time I bought a pound that cost me almost $20 at Whole Foods (CRAAAZY!). But if you’re willing to shell out a few extra bucks, go for the pancetta because it’s what makes this dish amazing. Cook spaghetti in salted boiling water according to the instructions on the package. Whisk the eggs and the egg yolk well, then add the grated Parmesan cheese and whisk again. If you're using unsalted bacon, you can add salt to taste, if you want. Heat the olive oil in a large pan on medium heat. Add the garlic clove and cook until it turns golden brown. Remove the garlic clove and add the pancetta and cook until it turns golden brown and crispy. You can remove the extra rendered fat with a spoon, if you want. 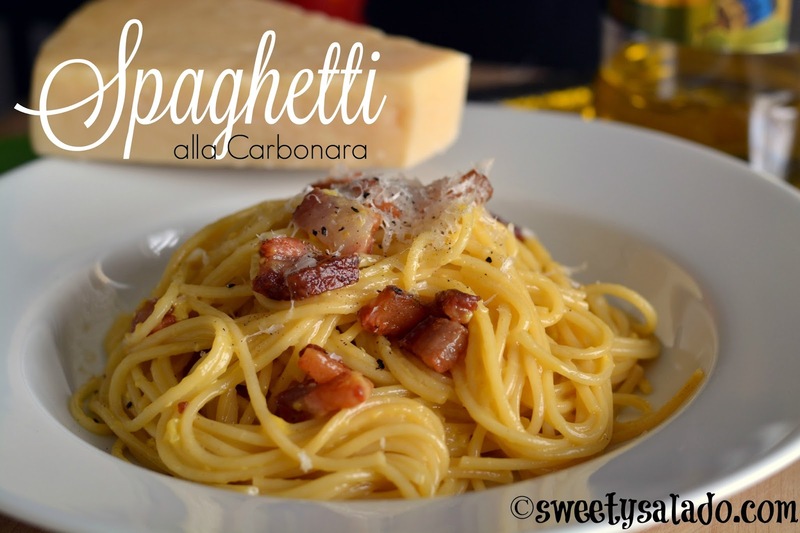 As soon as the spaghetti is cooked, add it directly from the pot to the pan with the pancetta and toss well. Remove the pan from the heat and let it cool slightly. Pour the egg mixture on top of the spaghetti and quickly toss it so the eggs don't start to cook. If the pasta seems a bit dry, add some of the pasta water you used to cook the spaghetti to make it creamy. Serve immediately with more grated Parmesan on top and freshly ground black pepper.